When we planned out our first trip with the boys last May, we knew we wanted to take them to Chef Mickey and The Crystal Palace. We had hoped to go to Chef Mickey for JSL’s actual second birthday, but that did not work out. Instead, we made this our starting meal the evening we arrived. The food was very good, and the atmosphere was fun, but the experience different than we expected. As I have shown before, both of the boys started the trip scared of the costumed Mickey, Minnie, Goofy, Pluto and Donald Duck. By the time we moved on to The Crystal Palace for JSL’s birthday, NHL had warmed up to the costumes, and JSL would tolerate them from a distance. JSL is now asking to see Pooh Bear, Eeyore, Tigger and Piglet, so perhaps things will be different this visit to Disney. 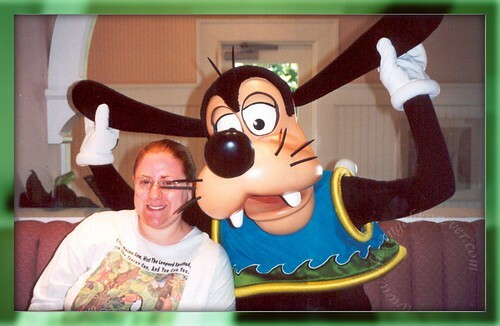 By the time we made our reservations for the Disney Social Media Moms Celebration, there was no real availability for dinners with characters. We opted to change things up a bit. We are going to do breakfast with Donald Duck before Animal Kingdom opens up one morning, and go back to visit Goofy and friends at Cape May Cafe. With any luck, both of the boys will enjoy themselves and we can capture some memories of the meals. 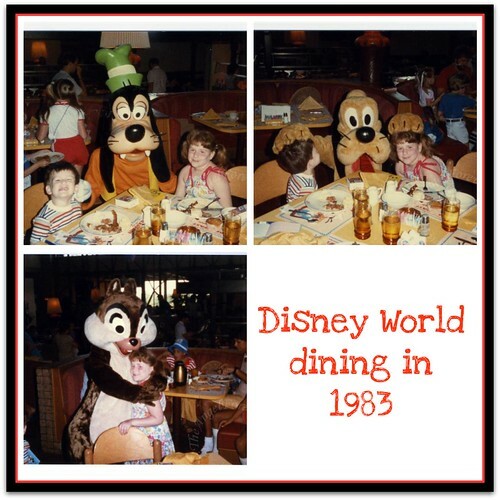 Speaking of memories, here are some old school Disney Character Dining photos from 1983. I believe this was at the original Chef Mickey when it was located in what would eventually become Downtown Disney. Ah, love the memories and hope to make some more amazing ones with our boys as we explore more magical moments at Disney World. We did the Princess breakfast the very first time we took Kacie to Disneyland. It was totally worth it. Even I was awestruck when Cinderella walked in. .-= kailani´s last blog ..Project 365: Day 36 =-. I LOVE character dining!! It is just so fun!!! .-= Upstatemomof3´s last blog ..Kik Pea Alecha (Chick Peas Stew) =-.